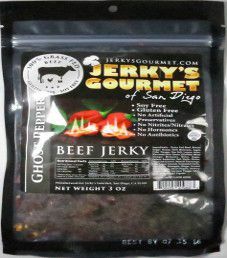 The next review on Jerky’s Gourmet of San Diego will focus on a 3 ounce/85 gram bag of their ghost pepper 100% grass-fed beef jerky flavor. This jerky was kindly submitted for review by one of the co-founders, Tim Gertsman. 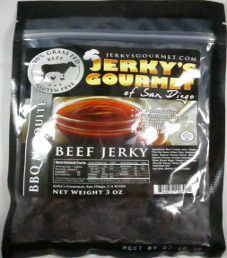 The next review on Jerky’s Gourmet of San Diego will focus on a 3 ounce/85 gram bag of their BBQ Mesquite 100% grass-fed beef jerky flavor. This jerky was kindly submitted for review by one of the co-founders, Tim Gertsman. 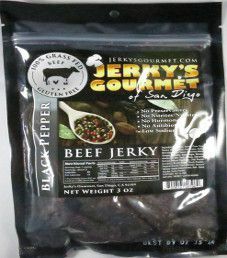 The next review on Jerky’s Gourmet of San Diego will focus on a 3 ounce/85 gram bag of their black pepper 100% grass-fed beef jerky flavor. This jerky was graciously submitted for review by one of the co-founders, Tim Gertsman. 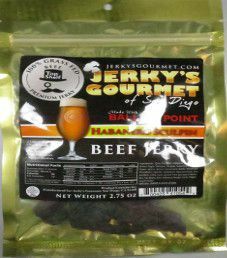 The first review on Jerky’s Gourmet of San Diego will focus on a 2.75 ounce/78 gram bag of their Ballast Point Habanero Sculpin beef jerky flavor. Ballast Point Habanero Sculpin is a local India Pale Ale (IPA) craft beer from San Diego, California, and brewed with fresh habanero peppers giving this beer quite the kick. This jerky was kindly submitted for review by one of the co-founders, Tim Gertsman.